Of the six-or-so most commonly used botanicals in gin – juniper, coriander, lemon, orange, angelica root and orris root – it’s the latter two which are the most foreign in the average gin drinker’s everyday life. Though once common in European medical and culinary traditions, both are now merely niche plants – iris is relegated to the world of perfumes and angelica is primarily relegated to the world of spirits, and gin especially. ‘Wow, you can really taste the orris root in here!’ isn’t the kind of thing most gin drinkers will say. But that’s not the botanicals’ fault. It’s often in gin for a wholly different reason. 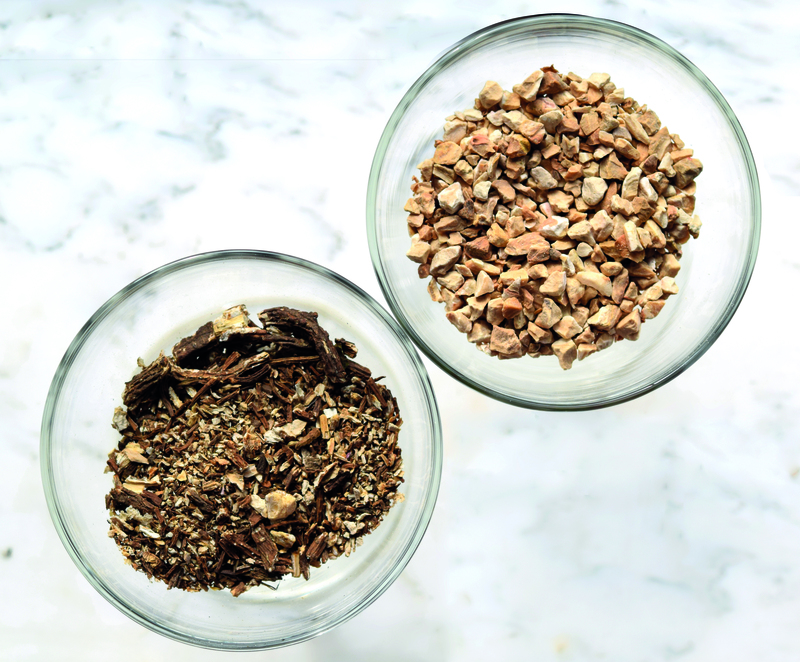 Distillers will often describe both orris root and angelica root as having a ‘fixative’ property in their gins. The term comes from the world of perfume where perfumers would use certain ingredients primarily for their effect in helping a mixture to retain its aroma for a longer period of time. Fixatives do this by slowing down the evaporation or volatilisation of aromatic compounds. When a compound volatilises, you smell it. By slowing this volatilisation down, you can prolong the aroma. gin. They do, but it’s often more subtle. Both tend to cluster in a gin’s base notes – those aromas and flavours that seem to take a back seat – emerging either with time, or manifesting on the back of the palate as a gin dries out on the finish. Some describe their effect as ‘adding depth’ or ‘rounding out the gin’. As similar as they might be in some regards, they do have their own histories and character worth diving into individually. Angelica (Angelica archangelica) is also commonly referred to as garden angelica. on what qualities one is looking for. Roots harvested in the summer have a greater quality of a minty and juniper-like aroma owing to greater quantities of beta-phellandrene at that time of year. Roots harvested in the plant’s first autumn are small and tender, while older plants have woodier tubers that can weigh almost a kilogram. The roots are often dried before distilling. Though the plant grows wild all across Europe, much of the angelica commercially available is sourced from France, Bulgaria, Germany or Hungary, with some distillers suggesting that it’s the angelica root from Saxony that is the best of the bunch. Pentadecanolide was first discovered in 1927 in angelica root essential oil by German researcher Max Kerschbaum, who was working for the firm of Haarmann & Reimer, who just half a century prior was the first synthetic aroma factory in the world. Musks were extremely valuable in perfume because of their fixative effect, and equally as expensive as before synthetics they had to be obtained from animals. But angelica was a rare plant based musk, and is still one of the most important plant based musks. Whether or not pentadecanolide (or any of the similar lactones in angelica) contribute to a fixative effect in gin is not known with certainty. However, distillers looking for some support for their case need look no further. Tastewise, many gin drinkers perceive angelica as part of the juniper notes in a gin. The two form such a foundational accord of the classic style gin flavour that it can be hard to separate which notes come from which. To get a better feel for angelica root on its own, try something like GrandTen Distilling’s Angelica Botanical Liqueur and then return to some of the classics below. And see if you can pick out that alluring, woody, bittersweet, celery-tinged musk underneath the surface. Angelica seeds are also used in gin, albeit much less frequently. The seeds are small, khaki coloured with a slight starfruit like appearance to them. They have much less pentadecanolide than the roots and therefore impart a somewhat fresh, green, slightly sweet and peppery character – very different from that of the roots. Often the seeds are included as a botanical accent and are not generally part of angelica’s purported fixative properties. Gins featuring angelica seed: Suntory Roku, Boodles London Dry, Beefeater, Beefeater 24. Another botanical widely cited as a fixative in gin is the orris root. These are the dried rhizomes of the Iris pallida and Iris germanica, the latter of which the famed Florentine Iris is a subtype. Irises grow for several years before their roots are ripe for harvesting. In the autumn, farmers dig up the plants, harvest the largest rhizome from a plant and leave the smaller ones for another season. Once harvested, the roots are washed and peeled before they undergo their gradual transformation. When the orris root is pulled from the ground, it doesn’t smell like much. It takes years for the compounds inside the root to slowly metabolise into irones, the sweetly floral compounds which give the root its alluring smell. Perfumers and distillers alike use the dried roots though both remain divided on how long it takes before use. Some say the roots are ready in two, while others say it takes more than five years. Chief among the orris root’s aromatic irones is Alpha-Irone. Its smell is described as being powdery and woody with violet and raspberry like nuances. Although one of the five most common botanicals used in gin, the distinctive orris note is rarely detectable on the nose or palate. Most distillers use it for its touted fixative properties, or in conjunction with other botanicals as part of a gin’s earthy base notes. Gins featuring orris root: Citadelle, Buss No 509 Raspberry, Plymouth, Gordon’s, Green Hat, Ki No Bi. Iris flowers are rarely used in gin as they’re both delicate and lack the aroma for which their roots are so renowned. That being said, some gins use the flowers as a colouring agent. Though they impart a remarkable shade of blue to the spirit, they add very little in terms of flavour or aroma. Gins featuring iris flowers: Magellan.